From half to full diameter. Easily changed to accommodate flow/media changes, half-full lines, fluid separation, etc. Extremely sensitive unit designed for minimum actuation. Available in explosion and non-explosion proof models in screwed of wafer tees. Recommended for line sizes up to 2" inclusive. 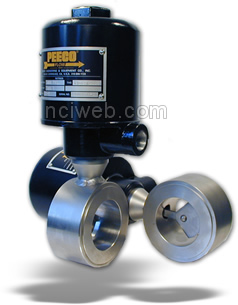 These units -- designed for extreme sensitivity -- allow full flow with minimal pressure drop. Flows of less than 0.01 GPM can be reliably detected. Low flows of gases require a special feature to compensate for chatter created by the compressibility of gas. This is accomplished by introducing a constantly expanding taper on the inlet side, so when the paddle moves the gas expands uniformly.